Agricultural producers and Nebraskans of every stripe can access a wealth of information on planning for climate change when they visit UNL Institute of Agriculture and Natural Resources exhibits at this year's Husker Harvest Days. The event is Sept. 15-17 just west of Grand Island. 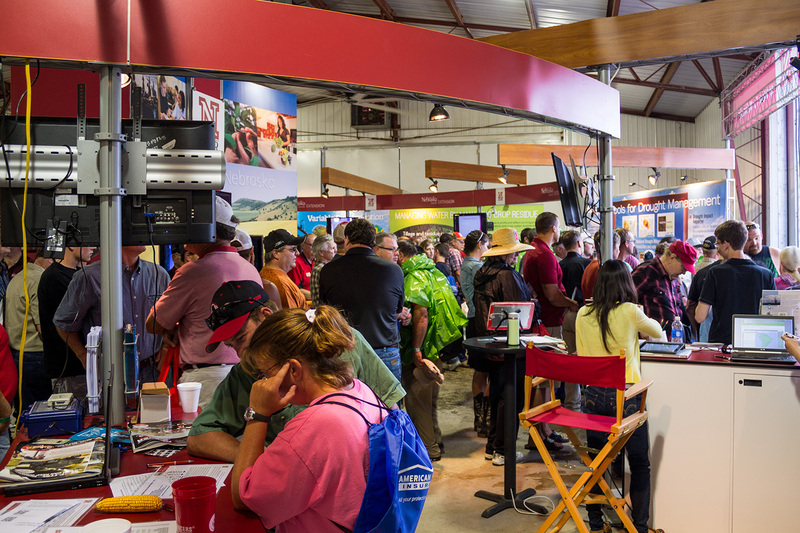 Husker Harvest Days 2015 attendees in the UNL Big Red Bldg in the south central area of the event grounds. "Successfully weathering extremes" is the theme for Nebraska Extension exhibits dealing largely with planning for potential weather extremes from climate change on the farm and ranch, as well as climate change-induced challenges and opportunities in everyday life. "This is such an important topic on so many levels that we will examine it from many angles over both this and next year's Husker Harvest Days shows," said Ronnie Green, NU vice president, IANR Harlan Vice Chancellor and interim senior vice chancellor for academic affairs at UNL. "It's part of our focus on critical and groundbreaking research and initiatives that are important not only to all Nebraskans, but nationally and globally, as we enhance our reputation as a leader in critically important research." the role of corn yield projections based on climate/weather in agricultural decisions. UNL's adjacent open lots, east of the Husker Red building, will feature living exhibits of demonstration cover crops, plantings of switch grass for ethanol production and other uses, technologies for conserving water use in irrigation, and shade systems for reducing heat stress in feedlots. "We believe this space has considerable potential for demonstrating the innovation and research of IANR in the form of living exhibits," Green said. "These exhibits tie directly into what showgoers will learn about when they visit the exhibits inside our building." Also inside the Husker Red building, IANR staff will be available to answer questions on a variety of extension and research-related topics, provide copies of helpful NebGuides and direct those needing further help to extension experts in their local area. Showgoers will also be able to learn about the latest opportunities for students at UNL's College of Agricultural Sciences and Natural Resources, and the Nebraska College of Technical Agriculture at Curtis. College representatives will be available throughout the show to answer questions from potential students. Those interested in the Nebraska LEAD (Leadership Education Action Development) program can also visit with a LEAD representative. IANR has been part of Husker Harvest Days for nearly 40 years, since the first show in 1978. "We enjoy the opportunity to bring the University of Nebraska-Lincoln to Husker Harvest Days and seeing all the people that stop in to see us each year," Green said. "We always appreciate the opportunity to visit with stakeholders about what they see as Nebraska's main challenges and opportunities. We are your land-grant university."